Curb bumpers, pictured above, protect Swift buses and the curb from damage. Curb bumpers are bright yellow and made of a durable material. Swift buses pull up to stations directly against the bumpers, to get as close as possible to the curb. The bumpers also serve as a guide to provide even spacing between the bus tires and the curb while protecting both from damage. 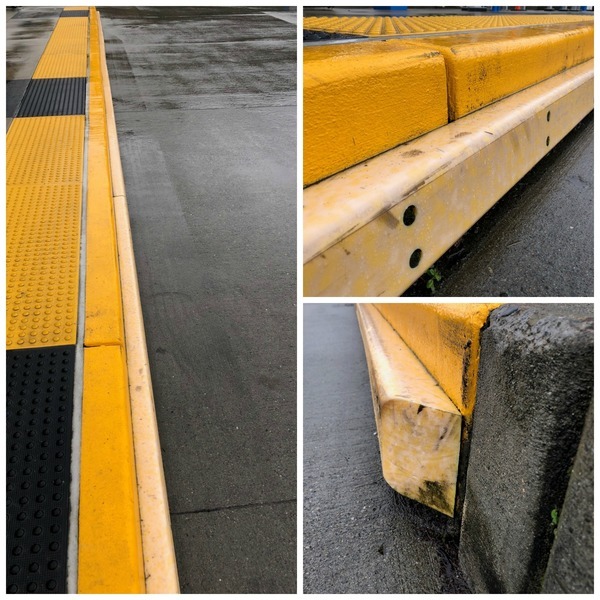 Each curb bumper installation at a station takes a day to complete. Bumper installations continue next week and will be ongoing with periodic single lane closures along the Swift Green Line route. These closures can cause a slowdown with traffic merging into one lane. During Swift Green Line construction, concrete pads were installed in traffic lanes in front of stations. They are hardier than asphalt and will better withstand the frequent service of Swift buses, reducing the need for costly maintenance in the future. The installation of the concrete pads sometimes covered road striping near the stations, requiring the paint to be reapplied. Striping includes dashed lane markings and bike lanes adjacent to stations. Striping work along the Swift Green Line route is weather dependent and requires dry and non-freezing conditions. Weather permitting, crews are scheduled to apply road paint along 128th St., near the westbound bus-only lane approaching I-5. This includes the bus-only lane to the east of the intersection and the bus pull-out area to the west of the intersection. This work requires the lane to be closed and is scheduled to begin at 9 a.m. on Tuesday, Feb. 5. Road striping at stations will progress along the Swift Green Line route beginning with northernmost stations and working south as weather permits. If you ride a local bus affected by stop closures or relocation, subscribing to Rider Alerts will notify you as soon as the stops are open. Subscribe for either email or text alerts (or both) at www.communitytransit.org/subscribe. To see the status of these stops without subscribing to an alert, visit bit.ly/GreenLineLocalStops. On Jan. 22, during our most recent webcast, Martin and June gave Swift Green Line construction updates which included inspections, testing, ticket vending machine installations and more. To watch the latest webcast and get answers to some of the questions asked during the live webcast, visit: https://www.communitytransit.org/ctlive. Want to stay in the know? Join us on Tuesday, Feb. 12 at noon. Spend your lunch hour with Martin and June while they spend 30 minutes giving you the latest Swift Green Line news and answer your Community Transit questions. They'll be available to answer your questions in real time, too! If you can’t attend the live webcast, you can submit questions ahead of time and view the recording later at https://www.communitytransit.org/CTLive. March 5: An expanded 45-minute webcast covering the March Service Change. March 19: An expanded 45-minute webcast covering the March Service Change and upcoming Swift Green Line launch events. An eastbound lane will close on 75th St. from the Seaway Transit Center to 16th Ave., due to City of Everett inspections. The city plans to inspect manholes, curbing, pavement, and gutters. The single lane closure is scheduled to occur on Tuesday, Feb. 5 from 7:30 a.m. to 4 p.m. and won’t impact Community Transit or Everett Transit bus stops. Bus traffic flow testing is scheduled for next Friday, Feb. 8 from 10 a.m. to 1 p.m. at the Seaway Transit Center. The testing involves buses and shuttles representing Community Transit, regional partners and Boeing. More details to follow in the next issue of Swift Network News. 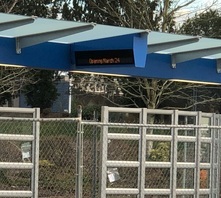 The Swift Green Line will run between the Canyon Park Park & Ride in Bothell and the Seaway Transit Center, currently under construction near the Boeing Everett plant. Swift Green Line buses will serve 34 stations at 16 intersections and two terminals every 10 minutes on weekdays, and every 20 minutes on weeknights and weekends. 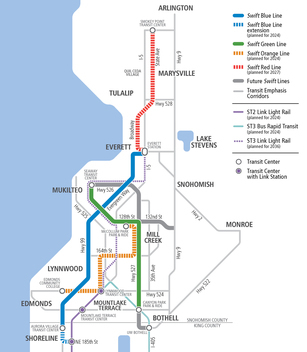 The Swift Green Line will connect with the Swift Blue Line at Hwy 99 & Airport Rd., establishing Snohomish County’s first high-capacity transit network. The network will eventually include more Swift lines and Link light rail (see map above). The Swift Green Line will begin service on March 24. © 2019 Swift Network News is published bi-weekly by Community Transit.